At Facebook’s presser today, Mark Zuckerberg introduced three big announcements: algorithmic friends, privacy dashboards, and personal information downloads. Facebook’s much-hyped live press conference today didn’t touch on any of the rumors swirling around the blogosphere: neither a Facebook phone nor any kind of deal with Skype came to pass. CEO and founder Mark Zuckerberg specified that he wasn’t going to be talking about “all the things we’ve seen on the blogs.” Rather, he said he wanted to focus on more a “fundamental problem”: privacy and control of information. Now you can. 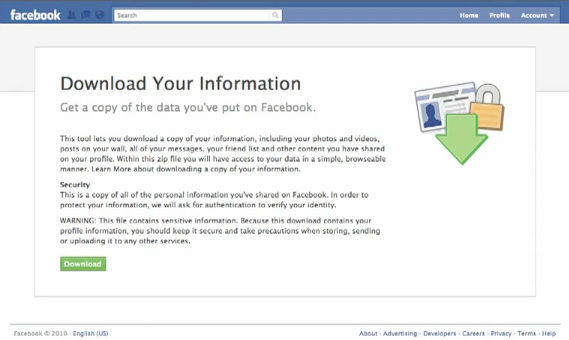 Using the Download Your Information option, everything Facebook knows about you can be downloaded in a single handy Zip file that can be accessed offline. Messages, photos, videos, wall posts, comments: your online identity on your desktop. 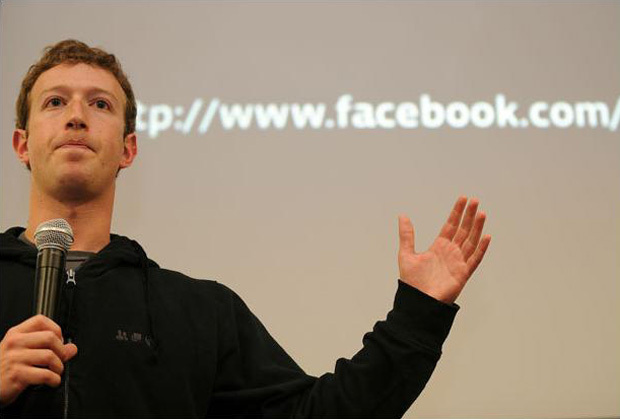 “You put stuff that you into the site, you should be able to take out,” Zuckerberg explained. button. So when information is requested, a link to the download will be sent via email. When clicked, users will have to re-log in to Facebook. But what if your email gets compromised? Not to worry, says Facebook. You may soon have to provide more information to prove your identity. The site is testing with what Zuck called social CAPTCHAs, which would require users to identify a series of pictures of their friends. 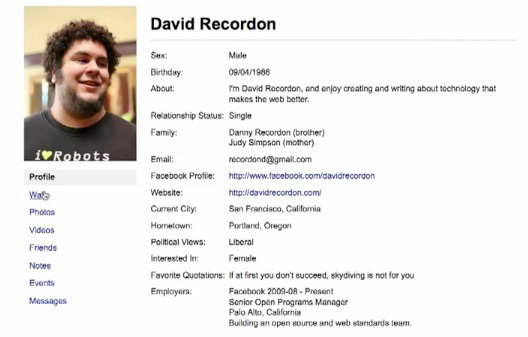 Much of your Facebook information is spread out across the web, beyond the site itself, using Facebook Connect. According to Zuck, more than a million sites use this cross-channel capability. But until now it has been near impossible to map which sites and apps have access to this information. Today, Facebook launched a new dashboard to address this issue. Zuckerberg called it a way for us to “audit” our information online. Now, using the dashboard, you can see which applications are using your data, the permissions you’ve given those apps, and the most recent times that our information has been accessed–a “detailed access log” as it was called. We give our data out to all these sites, but we “haven’t had a way to see that after-the-fact, or all in one place,” Zuckerberg said. 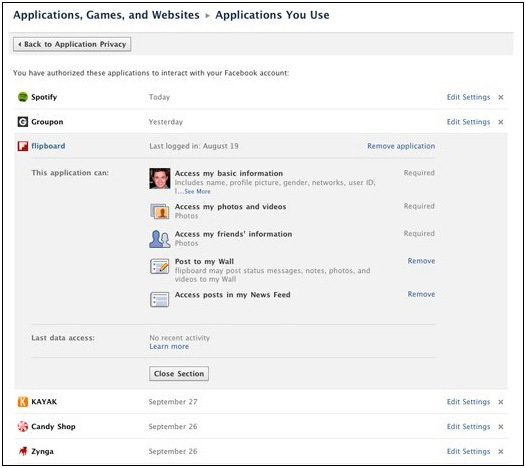 Using the dashboard, Facebook users can now change the access permissions these apps and sites have to your data, all in one place. The dashboard is essentially an all-in-one privacy manager, for your to monitor and adjust settings depending on what third-parties are accessing it. “We talk about this internally as the biggest problem in social networking,” Zuckerberg began, when introducing today’s third announcement. The CEO was referring to friend groups, a way of classifying your friends in levels of closeness–such as, say, your friends from work, or home, or college. don’t want to see what they eat for breakfast,” he said. To do this, Facebook will now create friend groups for you. In the past, Facebook has attempted “naive solutions,” which boiled down to asking Facebook users to make their own lists. According to Zuckerberg, less than 5% of users took advantage of this option. Even fewer people made more than one list. How did Facebook decide to solve this issue? “Let’s design an algorithm!” smiled Zuckerberg. Based on an algorithm already used internally, Facebook has developed an “index for each relationship,” which tracks which friends you are close with, and which friends you are not. 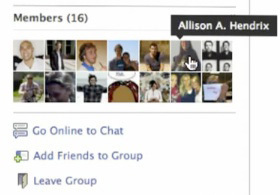 From there, Facebook will suggest groups for you, and help you populate the groups you’ve created. “We can help you know … who you are likely to be close with,” explained the CEO, who estimated that the new feature could see 80% coverage over time. These groups, Facebook’s product heads added, can of course be edited by users. They’ll also help populate a slew of new apps added to Facebook, including group chat and group document editing. But Zuckerberg also expressed the limits an algorithmic solution, and said that a “social solution” would be crucial. Essentially, Facebook’s algorithm will suggest friends for you, and then the social component–that is, tagging you friends the same way you tag photos–will correct any flaws. All in all, these three announcements addressed one central issue of Facebook: privacy. Creating personal info downloads enables users to see what information is online; adding dashboards enables users to control what information is online; and adding customized groups of friends entices users to share more of the information with Facebook. “The organizing principle [of today] is giving people more control and more confidence over exactly who sees what they’re sharing, exactly how they can get it out, and exactly how they can control how it’s being used by the third-party experiences,” said Facebook’s Justin Schaffer, the former CEO of Hot Potato, crystallizing the company’s announcements.